Hat tip to the Daily Bread blog. This week, the Physicians Committee for Responsible Medicine is hosting Capitol Hill briefings with a low-meat perspective on child nutrition programs (328 Russell Senate Office Building, 2:30 pm, April 30; 122 Cannon House Office Building, 1:30 pm, May 1). The Food Research and Action Center has a page on child nutrition reauthorization news and analysis. Briefly live-blogging a portion of the webcast of the third meeting of the 2010 Dietary Guidelines Advisory Committee (agenda .pdf). Presentation by Adam Drewnowski, University of Washington: "There are people who cannot afford many of the foods that are being recommended." Still, for the most part, he doesn't overstate the case that economics drives nutrition problems, noting that there are healthy affordable foods (once one gets above the most desperate minimal budget levels). Committee member Lawrence Appel asks a skeptical question about whether people would really eat much differently if healthy food were free. Drewnowski: "Energy dense foods do taste good. I admit that. Yes, they do." Presentation by Frank Sacks, Harvard School of Public Health. Says blood pressure benefits are accentuated at particularly low sodium levels. This contrasts with the Salt Institute's input to the committee, arguing that only a fraction of people benefit from salt reduction, and that low-salt diets may have harmful side effects. Reacting to an argument that young and middle-aged people needn't limit salt, because their blood pressure is less responsive to sodium intake, Sacks notes dryly: hopefully, if they survive, the 45 year olds will live to become older. Sacks also summarizes a growing body of research suggesting that patterns of weight loss and regain over time are similar across weight-loss diet strategies (Ornish, Atkins, Weight Watchers, etc.). Although the Dietary Guidelines have traditionally reflected a reductionist approach, emphasizing nutrient recommendations, Sacks doesn't shy away from the implications of his summary. In response to a question about whether the old Dietary Guidelines recommended range for fat calories is still correct, Sacks takes a line that one might equally have heard from Michael Pollan: perhaps we don't even need a recommended macronutrient range for fat. "Recommendations should be based on food." Presentation by Patricia Crawford, University of California. In the same vein: "People want food-based specifics for the translation of nutrient guidelines." I am still looking for something stronger than "the residents believe" or stitching together a series of Google hits into a conclusion. I think we all are, but I don't think it refutes the fact that something is not right in La Gloria and whether confirmed or not, the people of La Gloria are using the outbreak as a cry for help. The waters of "Carroll" cause pestilence gullies (that) seep into the ground. We do not know if (for) 600 jobs created by the Americans (Smithfield), the government.... is willing to poison 30 thousand of its citizens. Among the arrest warrants(of dissenters),was Ms. María Verónica Hernández Arguello, identified as the main "harassment of the public" and other brave citizens of various communities of the Valley of Peroteand Journalists who were there to report the pollution caused by "Carroll of Mexico." And the governor promotes advocacy for journalists? A team of UN veterinarians is arriving in Mexico to examine whether this new deadly strain of swine flu, mixed as it is with genetic material from avian and human strains, could be lurking in pig populations undetected. Smithfield says none of its pigs are sick but the company has sent samples for testing. "What happened in La Gloria was an unfortunate coincidence with a big and serious problem that is happening now with this new flu virus," he said. La Gloria residents, though, have been protesting against the farm for months. Starting in February, one in six of the 3,000 residents reported health problems. The government initially dismissed the spike as a late-season rise in ordinary flu, but by April, health officials sealed off the town and sprayed chemicals to kill the flies that residents said were swarming about their homes. I have read many responses that this is not a food issue. Really? This is absolutely a food issue. The practices implemented to feed the high protein appetites of the West (and growing world) are unsustainable and destructive at the expense of the developing world. Sure pork may be 'safe to eat,' but does that make it 'okay' to eat? Given the known (and now mounting) information of the destructive nature of CAFO's (Confined Animal Feeding Operations) to human health, water, soil, rural communities and the animals themselves, at what point will we draw the line? This is THE food issue. One of the best responses I have seen is "Why the Smithfield-H1N1 question matters" again from Paula at Peak Oil Entrepreneur. We are very comfortable that our pork is safe. This is not a swine issue. This is a human-to-human issue. Although speaking specifically on the issue of safety, I think Mr. Pope should revisit his last comment. This is a human to human issue, between Smithfield Foods and the people of La Gloria. Tom Philpott has since posted a follow up to his original post: Symptom: swine flu. Diagnosis: industrial agriculture? I just got home from the opening of Food Inc., a documentary that pulls back the veil of the industrialized food system. Repeatedly mentioned is the danger in the consolidation of the meat industry. Could the recent outbreak of swine-flu be connected to industry practice? The World Health Organization has declared the swine flu outbreak a "public health emergency of international concern." As of 9:00 AM on April 26, CDC has confirmed 20 human cases of swine flu in the U.S.: 7 in California, 2 in Kansas, 8 in New York City, 1 in Ohio, and 2 in Texas. Tom Phillpot, over at the Grist has revealed that the outbreak may be linked to Smithfield (Factory) Farms. He was crediting the tip to Paula Hay and her Smithfield coverage at Peak Oil Entrepreneur. The blogger investigative reporting can be linked back further to a Twitter "hat tip" from hyperlocavore. Large-scale swine producers in Mexico deny that their industry is the source of the deadly new influenza strain, saying the animals are all healthy, and that it is scientifically "not possible" for hogs to infect people with the illness. But lawmakers in the eastern state of Veracruz are now charging that large-scale hog and poultry operations are "breeding grounds" of infection that are making people sick and fueling the pandemic. The nation's hog industry says it is not to blame for any human illness. "We deny completely that the influenza virus affecting Mexico originated in pigs, because it has been scientifically demonstrated that this is not possible," said a statement issued by the National Organization of Pig Production and Producers and its president, Mario Humberto Quintanilla González. Nine finalists for the first-ever Growing Green Awards were announced today by the Natural Resources Defense Council. The awards recognize individuals who have demonstrated extraordinary contributions to sustainable food in advancing farming practices, climate and water stewardship, farmland preservation and social responsibility from farm to fork. The finalists’ achievements include ingenious on-farm practices to minimize reliance on chemical inputs, energy and water; ecologically integrated urban aquaculture; leadership in influencing large institutions to purchase more sustainable food; and outreach to help consumers better understand the relationship between food and environment. Michael Pollan has a related blog post, explaining the motivation. Living Richly. We have had two more Living Richly dinners. Briefly, the third dinner had quiche, home-made bread, home-made hummus and more, and the agenda was singing songs and playing board games together (one can't have meetings about frugal living every month!). The fourth dinner had a great Louisiana rice dish, and the agenda was an update on projects we started at the second dinner, including an informal babysitting coop, a small home gardening project, worm composting, food storage, and, most importantly, shared participation in a new Community Supported Agriculture (CSA) project at a site in East Arlington. Enterprise CSA. The CSA dropoff in East Arlington, MA, will get a weekly delivery of food shares from Enterprise Farm every Wednesday afternoon at Calvary United Methodist Church. There are large shares and small shares available. The prices are high in one respect (more money than one usually pays for produce in one lump sum or even monthly) and low in other respects (less expensive than equivalent pounds of organic produce). I am most looking forward to meeting the same neighbors every week at pickup time and chatting about what food is in season and how best to prepare it. The whole community will have the same seasonal produce at the same time, much as most humans have had throughout history and around the world. Contact me by email for details if you would like to participate. Dinner Diaries. The next, fifth, Living Richly dinner will be Sunday, May 17. We will have have an after-dinner talk and book reading by Betsy Block, a local resident and author of The Dinner Diaries -- Raising Whole Wheat Kids in a White Bread World. The book offers an entertaining account of trying to live better in our crazy food environment. A funny feature is the diversity of advice she gets from experts, such as my colleague Susan Roberts. Contact me by email if you live nearby and would like to come to the dinner and talk. Earth Day at Calvary Church. I will be the lay preacher at our neighborhood church, Calvary Church United Methodist, this coming Sunday, April 19, speaking on an Earth Day theme. The address is at 300 Massachusetts Avenue, and the service starts at 10:30 am. The place is welcoming to all people. 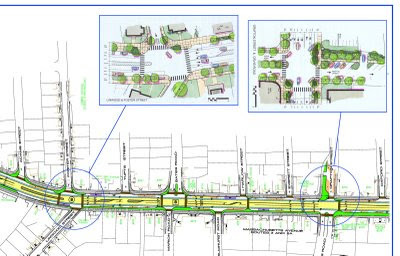 Massachusetts Avenue Corridor Project. A project is underway to transform the major road in East Arlington into a much better shared-use transportation corridor for cars, bikes, and pedestrians. But I fear it is at risk of never happening. Transportation engineers did better at planning, so far, than at communicating. They have a plan that seems to me likely to improve the neighborhood without harming traffic flows, but they haven't succeeded in explaining how this is possible to a skeptical business community and residents. To take just one example, traffic in the neighborhood is congested largely because of three major intersections which act like "spigots" on a water pipe, causing backups and cut-through traffic onto side streets. The new plan reduces lanes in parts of the corridor from four lanes to three lanes, while marking lanes more clearly so that traffic patterns and turning behavior are more sensible. The three lanes suffice for long stretches of the avenue, because the pinch points are what limited traffic flows anyway, and hardly any more cars could travel this stretch even if there were six lanes. At a neighborhood meeting a couple weeks ago, business people and neighbors were really terrified. A few spoke eloquently about shared use that benefits everybody, but most spoke against the proposal. Honestly, some sounded deeply prejudiced against cyclists. One business person gave at length a conspiracy theory that the transportation project was just a cycling agenda, when it really addresses a wide range of safety and traffic problems (.pdf), and includes bike lanes as one of many improvements. East Arlington Livable Streets Coalition, which includes all sorts of neighbors -- come to a meeting and see it's true -- has a web page on the Mass Ave project. EALS is planning an outreach effort to local businesses, probably on Saturday, April 25, to say essentially, "we love local businesses, and are some of your many customers who arrive by cars, bikes, and on foot." Can the malls say the same thing? No, malls are for cars and cars are for malls, but people come to local businesses in East Arlington with all sorts of mixed transportation. I think the transportation corridor project, if it happens, will be a boon to business. If you want your voice heard on this question, visit an East Arlington business by foot or bike on Saturday, April 25, and tell them how much you love them. The next chance after that to be heard is a Selectman meeting on Tuesday, April 28, at Hardy School, 52 Lake Street, ay 7 pm. Though my confidence has been shaken, I hope people turn out and speak with a high spirit. Update: Date for Betsy Block dinner corrected. Update: The EALS group wants to coordinate with the business community and other organizations about a good time for the "support local business" event, so the organized event will be postponed a bit. Since I already told a bunch of people, my family and some other friends and neighbors will still also visit the East Arlington business district on April 25. Recent discussion of how funding sources influence published results remind me to share a conflict of interest statement, short as it is. I earn my keep teaching at Tufts University, which is a financial interest sufficiently strong that I could be influenced by it in covering any U.S. food policy issues that affected university interests. Grant proposals I have written bring in some external funding to my employer, mostly from USDA. These research funds do not affect my salary, but they are viewed favorably by my employer and could affect my long term career prospects. They could suffice to make me write more delicately on some USDA topics, but I do my best to be impartial. For report refereeing or small research tasks, I have received $2,000 or less from USDA, University of Michigan, Research Triangle Institute, the Physicians Committee for Responsible Medicine, and Simmons College. I believe these honoraria do not influence my writing. 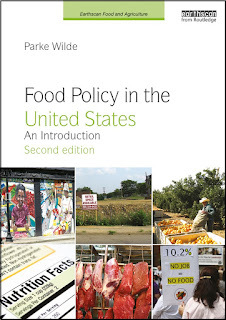 I have biases on many topics in U.S. food policy, mostly but not uniformly in a liberal or progressive direction, sometimes in a mainstream economics direction. These biases originate from long deliberation, not financial interest, and I do my best to remain impartial and fair. The blog itself accepts no advertising and gets no funding, nor does it have any expenses. I accept no product samples, and have not even accepted free books to review. Nobody asked, but it seems good policy to share such information before being asked. Civil Eats has good coverage of the latest in a series of undercover video reports from animal rights groups about animal cruelty at production facilities. In this case, commercial egg production. To me, the interesting thing is not just the images of cruelty. You can probably imagine that even without seeing the video. The more interesting question from a policy perspective is whether the video investigator can convince a skeptical viewer that the images are routine rather than exceptional. In this case, to my eye, the video is completely and successfully damning. The body language and tone of voice of the workers in the video say clearly, "this is all routine." This factory may be an unusually bad factory, but it is hard to believe the cruelty on camera is atypical in that factory. Short of government regulation, one of the best ways to enforce humane treatment standards is through self-regulation and third-party monitoring. In that light, isn't this response in a pro-industry editorial in Dairy Herd Management foolish to emphasize that the factory in question had been certified as compliant by the egg industry's monitoring organization? If I were a food industry writer trying to stave off regulation, I certainly would not have emphasized that failure of self-regulation in this case! The editorial is titled, "Secret Video Footage: Can You Protect Yourself?" The implication is that typical factories -- not just exceptionally cruel factories -- need to keep the public from understanding where its food comes from. If you were trying to stave off regulation, by implementing meaningful private-sector monitoring, is that the line of argument you would take? No, these people themselves believe they have an awful thing to hide, and they want to hide it well. Update: Okay, a comment points out that the editorial was not all bad, and I neglected the good parts because I suspected it of cynicism -- coded language where the talk about protecting animal welfare had a nudge and a wink. To give the full tenor, the editorial advises: "Maintain an employee handbook that strictly prohibits cruelty to animals, and enforce the rule on a “zero tolerance” basis." An Op-Ed article last Friday, about pork, neglected to disclose the source of the financing for a study finding that free-range pigs were more likely than confined pigs to test positive for exposure to certain pathogens. The study was financed by the National Pork Board. Ethicurean today discusses the larger context of antibiotic use in animal food production, which worries me more than free-range pigs do. Five food producers bring a $1 billion lawsuit over "dumping" of food imports from China at below production costs. The defendants are... U.S. insurance companies and the federal government. Okay, I think I have this straight. Domestic producers complain for years about "dumping" of food imports from China, a major trade policy concern. In what sounds on the face of it like a reasonable compromise, imports are permitted to continue, so long as the importers put up a bond for any penalty they may owe if the federal government concludes they were dumping. Importers buy insurance policies to cover their losses if they do have to pay the bond. Risk markets to the rescue! The federal government then assesses hundreds of millions of dollars in dumping penalties against the importers. The penalties are supposed to be distributed to domestic producers. The insurance companies refuse to pay and the importers cannot afford to honor their bond. The U.S. producers are trying to sue the insurance companies and the federal government. Just another day in U.S. Food Policy. The title of historian James McWilliams' op-ed last week in the New York Times is "free-range trichinosis" -- a hard-hitting call to alarm, given that trichinosis is a deadly disease. The op-ed summarizes research in the journal Foodborne Pathogens and Disease, which found higher rates of pathogen exposure among free-range pigs, including, McWilliams said, "most alarming, two free-range pigs that carried the parasite trichina (as opposed to zero for confined pigs)." The Center for a Livable Future and Marion Nestle suggest McWilliams should have more carefully distinguished the study's actual findings (about serum antibodies showing exposure/immunity) from the risk of disease (not studied in this preliminary research). They also suggest McWilliams should have at least mentioned that the study was sponsored by the National Pork Board, which often shares favorable research with journalists while never circulating unfavorable research. I asked McWilliams if he came across the study through sources that could be traced to the National Pork Board. (McWilliams, who is a fascinating and genial guy, a lively raconteur, and a vegetarian with a long history of free-thinking on food system issues, had the bad luck to owe me a beer from an enjoyable conversation on his recent visit to Boston, so he may have felt obliged to answer my email). In no way did the pork industry direct my attention to this piece--I am very much opposed to industrial meat production and would never be led by the nose to do the industry's bidding. I don't know a single soul, nor have I ever had even so much as an e-mail contact, with anyone in the industry.... The issue of finding large studies that lack any industry connection is a vexed one. Does the presence of industry funding automatically negate the legitimacy of the findings? I do not think so. It certainly demands heightened awareness, but if we tossed out all the beneficial findings about, say, organic agriculture because the studies were funded by organic interests, we'd have little concrete evidence of organic's many benefits. I agree with McWilliams' formulation, saying that industry funding does not automatically negate the legitimacy of the findings, but that it requires heightened awareness. At every stage of the scientific endeavor, from topic selection, to choice of methodology, to write-up, to distribution of results, industry funding exerts a gentle influence in selecting favorable results and screening contradictory evidence. So, doesn't "heightened awareness" suggest McWilliams at least should have mentioned the study's National Pork Board funding? "That's a tough question," he responded. My fear was that mentioning the funding source would have immediately led a substantial portion of readers to quit reading. Given that my goal in covering these controversial issues is to make sure that we in the sustainable food movement remain vigilant about the alternatives we have chosen, the last thing I wanted was to alienate readers who would automatically (and perhaps mistakenly) assume that the industry backing undermined the results of the study. If there was a precedent of journalists consistently citing funding sources, then perhaps I would say yes, I should have done it. My choice was to trust the journal's peer review process and not mention the funding source. Maybe I should have noted that the journal is highly respected and peer reviewed. McWilliams is the author of the forthcoming book, "Just Food: How Locavores Are Endangering the Future of Food and How We Can Truly Eat Responsibly." The latest round in the debate over soda taxes, discussed earlier, is an editorial this week in the New England Journal of Medicine by Yale professor Kelly Brownell and New York City health commissioner Thomas Frieden. Sugar, rum, and tobacco are commodities which are nowhere necessaries of life, which are become objects of almost universal consumption, and which are therefore extremely proper subjects of taxation. Will Saletan nicely summarizes Brownell and Friedan's argument in a Slate commentary that oozes disdain but makes no counter-arguments. The reader can supply them, I guess. 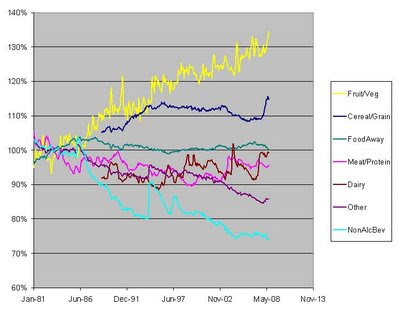 Relative prices have risen for fruits and vegetables, in the long term, according to the CPI. Perhaps Brownell and Friedan's idea is not to increase the relative price of soft drinks, but merely to give fruits and vegetables and other good stuff the same level of playing field that they had formerly. "What should the government mean by hunger?" Mark Nord and two colleagues ask this interesting question in a recent issue of the Journal of Hunger and Environmental Nutrition. A telephone survey of 1000 people offered respondents several scenarios, describing hypothetical people with symptoms of hunger to varying degrees. The authors suggested that many respondents describe hunger in a way that seems fairly close to the federal government's intended meaning for the term "food insecurity with hunger." Federal reports on food insecurity discontinued using the term hunger in this way a couple years ago, although one can still find interesting tabulations of a survey question about hunger deep in the appendices. Last week I posted Disney Eggs on Epicurean Ideal in response to Disney's new egg commercial. Disney Eggs were introduced in March 2009 in 2 test markets initially (Florida and New York), and will launch in Colorado in April. Disney Food, a division of Disney Consumer Products, wanted to offer a "better for you" egg that was fun for families with children. Having the quality endorsement of Eggland's Best, with their all natural, all-vegetarian patented hen feed seemed like a great fit. The eggs are high quality-stamped with Disney characters and the collections of characters will rotate every month, to refresh the product. The Disney Eggs product line consists of Large, Extra Large, 18-pack Large, Disney Cage Free and Disney Organic eggs. All the different versions are currently being offered and were presented to retailers in the 2 markets where the product was launched (Florida and New York). The retailers decide which and how many options they want to offer to their customer base, and currently retailers are only selling the #1 variety, which is Large, and no additional varieties at this time. Eggland's Best patented hen feed contains healthy grains, canola oil, and an all-natural supplement of rice bran, alfalfa, sea kelp and Vitamin E. The Eggland’s Best hen feed contains no animal fat, no animal by-products, and no recycled or processed food. Eggland’s Best never uses hormones, steroids, or antibiotics of any kind. Eggland’s Best eggs contain ten times more Vitamin E than ordinary eggs, 100 mg of Omega 3, shown to be beneficial to cardiac health, 25% less Saturated Fat, and 200 mcg of Lutein, shown to contribute to eye health. Kids will love the eggs because of the Disney characters, but parents will appreciate their nutritional value as well so it appeals to the entire family. In 2006, The Walt Disney Company introduced nutritious food guidelines limiting the use of the Disney name and its characters to only those kid-focused products that meet specific limits on calories, fat, saturated fat and sugar. Today, Disney’s extensive food portfolio offers nutritious options in key meal categories including fresh produce, bread, pasta, dairy and baked goods. "applies to livestock used for meat and meat products that were raised entirely without growth promotants, antibiotics, and animal (mammalian, avian, and aquatic) by-products derived from the slaughter/harvest processes including meat and fat, animal waste materials (e.g., manure and litter), or aquatic byproducts (e.g., fishmeal and fish oil)." One of the producers of Egglands Best eggs is Morning Fresh Farms which, by looks of their operations, is by no means a small family farm (although family owned). These types of tactics further the agrarian myth that people's food is coming from an idealistic farm with a red barn and roaming cattle. The egg industry is one that is very much industrialized no matter what certifications, claims and programs they put on the carton. Egglands Best does offer Organic and Cage Free Eggs, but I can't even find a picture of a chicken on their website. It reminds me of when I asked a student where hamburgers come from and he replied: "the grocery store." Do we want kids thinking eggs come from Mickey Mouse? In response to Disney Food: Disney Consumer Products uses their classic Disney characters to market a full line of processed foods, including frozen and dried pastas, baked goods, snacks, novelties, dairy, confectionery, beverages and breakfast foods. Disney Food, Health & Beauty takes an active role in the development and marketing of a diverse array of quality, innovative products that touch consumers' lives each day. Through new food licensing programs, product reformulations and relationships with leading manufacturers and retailers around the world, the Disney food group offers nutritious alternatives parents approve of and kids love. Some of my favorites are Mickey Pizza's, Disney Campbell's Spaghetti O's, Disney's General Mills Cereals, and Disney Tummy Ticklers & Bellywashers (100% juice drinks). While at first glance, it may seem that Disney is promoting healthier foods then the typical commercially processed and advertised foods, I side with Marion Nestle on the point that kids don't need special 'kid-friendly' foods to eat. Should we be inundating kids with more advertising? Campaign for a Commercial-free Childhood would say no. I would argue that this contributes to more disconnect between people and food culture. America's Clean Water Foundation (ACWF) in 2007 could not provide documentation requested by EPA's inspector general (.pdf), who was curious about a subcontract with the National Pork Producers Council (NPPC) to conduct clean water inspections on hog farms. I would call that a case of the fox guarding the henhouse, except that the barnyard metaphors would become too cumbersome. Former top EPA lawyer Jon Cannon withdrew from consideration as the agency's deputy administrator because of an investigation into the nonprofit America's Clean Water Foundation (ACWF), where he once served on the board of directors. An EPA inspector general's report (.pdf) claimed the now defunct ACWF mismanaged more than $25 million in federal grants by allowing a subsidiary of the National Pork Producer's Council to conduct clean-water assessments on hog farms. The Foundation did not comply with EPA regulations when procuring contracts and obtaining prior approval for contract costs. The Foundation claimed outlays of $21,107,498 ($12,308,145 under grant X82835301 and $8,799,353 under grant X783142301) for contracts awarded to conduct on-farm assessments. The first contract was originally awarded in fiscal year 1999 to the National Pork Producer's Council (Council). Subsequent contracts were awarded to Environmental Management Solutions, LLC, a 100 percent owned subsidiary of the Council. Environmental Management Solutions, LLC later changed its name to Validus Services, LLC (collectively referred to as Validus). The contract was extended several times through fiscal year 2005. All of these contracts were awarded without competition and without a cost or price analysis. In correspondence with the Director, EPA’s Grants Administration Division on July 27, 2005 and September 21, 2005, the Foundation’s Executive Director said that it did not perform a cost or price analysis because there were no sources of comparable data for it to use. Title 40 CFR 30.45 states that some form of cost or price analysis is required in connection with every procurement action. Price analysis may be accomplished in various ways, such as comparison of price quotations submitted, market prices and similar indicia. These contracts with industry trade associations should be competitively awarded and documented. I think the operations of the major animal agriculture checkoff programs and their associated trade associations play an under-appreciated role in U.S. food policy. The Robert Wood Johnson Foundation's Commission to Build a Healthier America today released 10 cross-cutting recommendations for health system reform. Nutrition and physical activity were featured in the recommendations, with at least as much emphasis as medical care. • Give kids a healthy start. Ensure that all children, especially very young children in low-income families, have high-quality education and child care. This means increasing federal government spending to support early childhood development for young children in low-income families. This recommendation is critical, because evidence is now very strong that early childhood has a tremendous impact on a person’s health across a lifetime. • Ban junk food from schools. Feed children only nutritious foods in schools. Federal funds should be used exclusively for healthful meals. • Get kids moving. All schools (K-12) should include at least 30 minutes every day for all children to be physically active. Although children should be active at least one hour each day, only one third of high school students currently meet this goal. • Help all families follow healthy diets. More than one in every 10 American households lack reliable access to enough nutritious food. Federal supplemental nutrition programs should be fully funded and designed to meet the needs of hungry families with nutritious food. • Eliminate so-called nutrition deserts. Create public-private partnerships to open grocery stores in communities without access to healthful foods. Many inner-city and rural families lack this access; for example, Detroit, a city of 139 square miles, has just five full-service grocery stores. The Commission sought to sidestep traditional political controversies in health policy by addressing both the personal and the political aspects of health care. This Commission has been charged with finding solutions outside the traditional health care system to improve the health of all Americans. Nutrition policy is an important place to start. In the current economic climate, there is no question that demand is growing for the food benefits and nutrition education offered by programs like SNAP, NSLP and WIC. As part of the Commission’s fact finding, I had the honor of convening some of this country’s top experts on nutrition policy to address how we can use and further develop these powerful levers to improve the health of Americans quickly, directly and sustainably. The group acknowledged that FNS program policies, such as the composition of school lunches, should be set based on sound nutrition research. The good news is that there is a growing consensus about what these nutrition standards should be. The challenge – for advocates and policymakers at all levels – is addressing the funding constraints that impede these programs from achieving the highest nutritional standards. It is clear in many cases that these programs are underfunded at a time when demand is increasing. What struck me most was that everyone around the table – academics, advocates, federal program administrators and others – shared a commitment to finding the best way to manage these programs and get individuals the support they need in these challenging times. This shared vision is key. Achieving better health through better nutrition is not just a Federal responsibility—it requires the commitment of school districts, grocery stores, communities, and state and local governments. I am clearing out my email in-box. I'll spare you the news about academic management controversies and share just the more fun stuff. Boston University is hosting a conference May 8-9 entitled The Future of Food: Transatlantic Perspectives. My wife and I are going to try to get a babysitter so we can see the lecture and dinner by eco chef and food justice advocate Bryant Terry. This coming weekend, the Lowell, MA, free film festival has a food and fair trade theme. Along with a group of other researchers, I enjoyed meeting Michael Pollan and hearing a lecture by him on his recent visit to Tufts. A magazine article and a video are available. A colleague and I moderated our school's weekly seminar the next day, using a debate format for questions from the audience, followed by a sequence of iClicker polls of the gathered community of nutrition experts and graduate students. The debate questions concerned some of Pollan's more provocative points from his talk. Like: "Nutrition science today is about where surgery was in 1650." It was lively. Friedman School graduate student Emily Morgan's report about fruit and vegetable consumption and waste in Australia is a featured link on VicHealth, the website for the Victorian Health Promotion Foundation. Morgan studied the issue while in Australia on a Fulbright. The Onion reports today on a new high-level commission report calling for radical food policy reforms. It is the season for signing up for Community Supported Agriculture (CSA) shares. Some that have fallen into our orbit at one time or another in the inner Boston suburbs include Waltham Fields, PEAS, and Enterprise. If you live in east Arlington, MA, feel free to contact me by email about a pickup site some neighbors are organizing. Okay, mission accomplished. Time to get the merit badge from BoingBoing. At the third annual graduate student research conference organized by Friedman School students this past weekend, I moderated a session with three fascinating presentations by Robert Paarlberg, Susan Roberts, and Mark Winne. Paarlberg praised the environmental potential of new "precision farming" technologies in conventional agriculture. He recommended targeted commercial pesticide applications and GMOs over organic agriculture. He argued that the alternative good food movement's emphasis on older food and farming traditions cause the movement to overlook the new industrial technologies that could really make a bigger difference for the environment. One of his punchiest claims was that organic and local agriculture hinders the adoption of new pro-environmental technologies by preventing farmers from reaching adequate scale. Yet, when pressed, he agreed that most high-technology agriculture in the United States is conducted by farms with a scale of several hundred thousand dollars to a couple million dollars in sales. This is larger than your neighborhood CSA but not really very big from the perspective of most U.S. industries. Certainly, even within a particular small regional foodshed such as New England, there is room in the market for many competitive producers on this scale. Similarly, the federal government's organic labeling standard allows farmers of all scales to be organic. Reflecting on Paarlberg's presentation, I could not see how local and organic agriculture really threatened most of the environmental farming technologies that Paarlberg finds most promising (GMOs, prohibited in the organic rule, are an exception that requires more discussion than time permits). Paarlberg's argument raises the question of whether organic and local food advocates can accept mid-sized family farms along with small farms as part of their sector. From advocates I have spoken with, I think the answer is "no problem." For example, see Bob Comis at Ethicurean yesterday, discussing the need for moderately larger scale in progressive meat and poultry production, to make good meat more competitive with factory farm meat. Or, consider Kathleen Merrigan's eloquent response to tough questions from Senator Saxby Chambliss (R-GA) at her Senate confirmation hearing today, explaining how she can advocate for sustainable agriculture and what Saxby called "production agriculture" at the same time (I'll add a link to a transcript later when it becomes available). Mid-scale local production preserves most, though not all, of the advantages of small-scale local production. And mid-scale production lowers costs and helps the local food movement overcome skepticism about its relevance to consumers of all income levels. Saxby sees organic agriculture and production agriculture as enemies. Instead, why can't local and organic agriculture can be production agriculture?